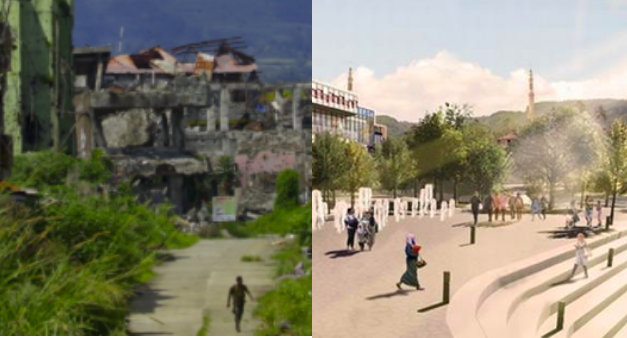 The shattered city centre of Marawi, left, and an artist’s impression of how a new riverside promenade could look in the city. The ground-breaking ceremony for the rehabilitation of Marawi has taken place, more than a year after the city was freed from Islamic State. “Our long wait has finally come to an end,” the city’s mayor Majul Gandamra said at the event today (Tuesday, October 30). The bloody siege of the city — which left much of it reduced to rubble — was declared over on October 17 last year. The rebuilding work was due to start in June, but has been plagued by months of delays. Mayor Gandamra also said how “harrowing” the past months had been for the city’s residents. He described the “pain of uncertainty”, not knowing if his city could ever be rebuilt. However, today he was able to express optimism. “In a few years from now, we hope to see a beautifully and strongly rebuilt Marawi City which shall be the pride of all Maranao people,” he said, to applause. Today’s ceremony marks the beginning of construction work inside the ‘Most Affected Area’ (MAA), the 250-hectare central part of the Muslim-majority city that sustained the most damage during the five-month terrorist siege. Philippine firm FINMAT International Resources has been chosen to complete the first phase of debris clearing in “sector 1”. The contract for this job is worth 75 million pesos and is expected to be complete by next January. Only after this clearing stage will city residents be allowed to return to their homes inside the MAA. Overall, the ambitious rehabilitation plan includes 22 components. The first to begin will be debris management, road improvements, including underground wiring, and “master development plan with feasibility study”. After these stages are complete, work will begin on the construction of new structures, such as new community halls with madrasahs in all 24 affected barangays, a “grand” central market and a city museum with a “school of living tradition”. Other new facilities planned for the 17 billion peso rehabilitation include riverside promenades, port facilities, a convention centre, multi-transport hub, memorial centre and schools.